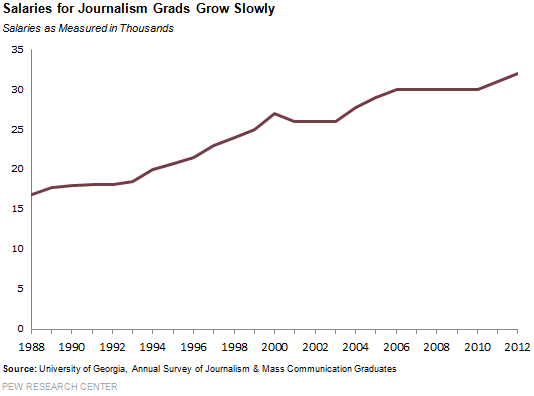 Despite the economic turmoil in much of the news industry, the job prospects for undergraduate journalism and mass communication majors continue to move “in the right direction,” according to a new University of Georgia survey of students who graduated in 2012. 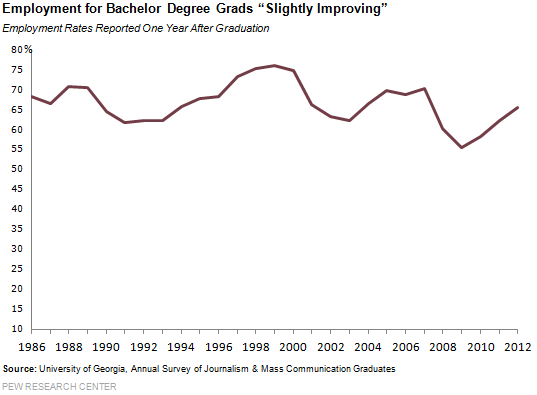 Nearly two-thirds (65.6%) of students earning bachelor’s degrees in journalism or mass communication found full-time work within six to eight months of their 2012 graduation-an increase from 62.2% in 2011 and an 18% jump from 2009, at the depth of the recession. Even so, the job outlook for journalism and communications grads has not fully bounced back to its pre-2008 level, when the overall employment figure for those finishing undergraduate degrees stood at 70.2%. “It’s been a recovery, but not a very robust recovery,” said Lee Becker, director of the James M. Cox Jr. Center for International Mass Communication Training and Research and a co-author of the report. Even as more graduates are finding jobs, the report findings suggest their salary situation is mixed. This year’s survey showed modest gains in journalism grads’ take-home pay, which managed to outpace the rate of inflation, currently less than 2%. But gains in wages have been modest in recent years. The median annual starting salary of journalism graduates increased from $31,000 in 2011 to $32,000 in 2012, but those salaries are only $2,000 higher than what they were in 2006. At the same time, the earnings of recent journalism and communication majors fall well short of college graduates who did not major in journalism or mass communication. According to the National Association of Colleges and Employers, the median annual salary of all 2012 graduates was $42,666-more than $10,000 higher. The survey finds that in order to supplement their incomes, recent graduates in journalism and mass communication are active in freelance work. Nearly a quarter (24.7%) of respondents with full-time jobs said they were actively freelancing as well. And more than four in 10 (43.3%) with part-time jobs reported working on the side. On average, bachelor’s degree holders earned $3,000 annually from freelancing-an increase from $2,600 in 2011. At the same time, the new journalism and mass communication graduates are entering a workplace where the benefits they receive from their employers have been significantly reduced from where they were in the middle of the previous decade. Slightly more than half (54.6%) of the respondents with full-time positions said their employer paid at least some basic medical coverage. This figure that has dropped steadily since 2005 when more than three-fourths (79.3%) reported receiving this benefit. Prescription drug benefits have similarly contracted. In 2005, 72.5% of newly-hired workers found jobs that covered at least part of their medication needs. Last year, only 46.1% of new grads received this coverage-a decline from 47.4% the year before. Compensation packages have also significantly trimmed maternity and paternity benefits. More than two-thirds (67.4%) of employers provided at least some coverage in 2005. This year’s survey of 1,823 graduates found that less than half (47.9%) of new employees had the same level of new parent perks. In addition, roughly half (46.7%) of new hires reported receiving retirement benefits in the workplace, compared with two-thirds (66.5%) in 2005. In responding to questions about their media consumption habits, the recent graduates revealed their heavy reliance on digital forms of news. Three in four respondents reported getting news online yesterday-a figure unchanged from 2011. The use of newspapers, on the other hand, continued to dwindle-dropping from 41.6% in 2011 to 36.6% in 2012. As recently as 2006, that percentage of recent grads who read a newspaper was 60.7%. The use of broadcast media, on the other hand, has remained more stable in recent years. In 2012, 63.7% of the new graduates reported watching television news yesterday, virtually the same percentage as in 2011, and a moderate drop since 2006 (75%). Similarly, 43.2% of respondents said they listened to radio news yesterday, compared to 42.7% the year before. That represents only a slight decrease from the 46% who said they got news on the radio back in 2006.